In our last newsletter we featured Marshall, a fabulous canine who suffers from extensive seizures. He is not the first dog I’ve encountered with this difficult & harrowing challenge. Chico, a darling dog very close to my pack, has suffered for years from terrifying grand mal seizures, but so far the super trooper keeps on coming good. It seems there is no clear effective treatment for canine seizures although there are a wide range of alternative options out there to try. After I included Marshal in our last newsletter I got an email from Debbie Moore of K9 & Feline Instincts. She wanted to help Marshall as she has been successful healing dogs from seizures (and other issues) through diet change. She wants to help as many dogs as she can. I invited her to share her findings with us all. So, here’s Deb! Hi dog lovers!I hope you and your K9 companions are well. Please let me introduce myself. 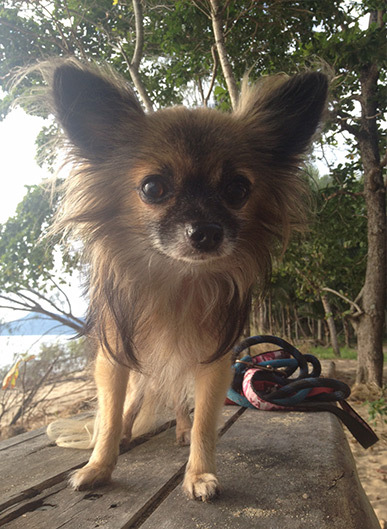 I am an animal lover based in Cairns Far North Queensland. I have many different types of pets from the furry to the, feathery and scaly. They are all special in their own way and bring so much joy to our household! There is never a dull moment! We endured many visits to many different vets, some gave medication and others said it was ‘an allergy’ possibly to the shampoo (I had used this shampoo all his life). Changing the shampoo did not make a difference. On the meds he was exceptionally thirsty, a little unsteady and not himself, I did some research on the side effects of the meds and stopped them as they didn’t make much difference to the seizures anyway. I was totally at my wits end, so I started researching the diet he was on, which was the processed sausage ‘fresh type food’ from the supermarket along with a very popular tin food. To my horror I found many articles online about pet food being laced with extremely high levels of a preservative called Sulphur Dioxide. This preservative can trigger severe neurological conditions in cats and dogs. Companies are allowed to use the preservative in pet meat products freely because there are no rules about labelling or how much can be added. This also means that the processed ‘meat’ can last in your fridge for weeks even months without breaking down, imagine what it is doing to your dog’s digestive system! I found that one product that was tested by The Sunday Mail had 435 times the Sulphur level claimed on the packet while others contained the preservative with no mention of it on the label. The sad reality is we are seeing so many unhealthy pets that are suffering from joint problems, decaying teeth, eye issues, skin and bladder problems to severe obesity and even behaviour problems. This could be due to a diet of packet, canned and dry food. I could not believe that I was basically ‘killing’ my best mate without even realising it! I felt ill as it’s up to us as the owners to provide what is best for our pets and for the majority this is our intention. In Australia alone pet owners spend billions of dollars a year on the ‘best food’ we think we can find, bedding, toys and medication for our furry companions. So for the past 5 years or so I have been researching dog and cat nutrition and trialling different butcher’s pet mince and a large variety of human foods with my own pets to find the most healthy, preservative free diet that I can. I was at the point where I had a whole shelf in both the fridge and pantry just for the dogs and cats! It was then that I decided I need to create something that can be combined with fresh ingredients such as: fresh raw meat, steamed vegetables, fruit, herbs, spices and fatty acids (oils). This could then be frozen into easy to serve portions ready to go. I now feed my dogs the most natural way that I can (as mentioned above) I also include bones and chicken carcasses for my dogs and chicken necks and/or wing tips for my cats. They have bones at least 3 times a week. Bones are great for their mind as dogs feel good when they chew (just like we feel when we eat chocolate or ice-cream! ), are brilliant for cleaning teeth, freshening breath and they keep them occupied for quite some time! Winning! Keep in mind that biscuits do NOT clean your pet’s teeth, they actually increase the tartar build up, and in time they will turn your pet’s teeth yellow and therefore encourage bad breath. The reality is we are all so busy, with work commitments, children, school, hobbies and chores that often a convenient diet such as supermarket food which includes: the dog sausage roll, fake meat parcels, tin foods or a bag of kibble does win for most. Some people pay well over $100 per bag of highly processed kibble thinking that it’s a great choice for their dog because it not only has wonderful packaging telling you that its ideal but it has been recommended by the store person (whom is most likely on commission) and/or even their local vet. It appears that some vets have a particular brand that they are encouraged to promote. The more sales the vet makes for that brand the more profit and support the vets receive. 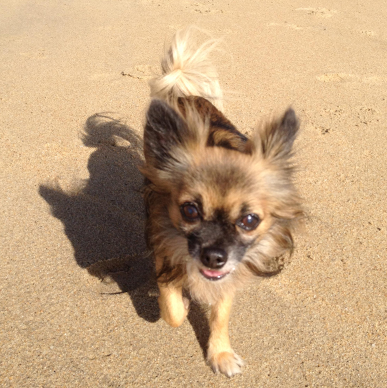 For my little dog it took at least 4 months on a preservative free, natural diet for the seizures to fully stop. They eased after about 2-3 weeks, this is when I was certain in his case it was the food. But it took his system a long time (probably up to 6 to 8 months) to recover before he was back to his normal mischievous self! It was trial and error with different foods as I found that cooked meat actually doesn’t agree with him at all. It really upsets his tummy and he gets all hunched up like he is hurting. He is fed only raw meat (along with cooked pasta, oats, steamed veg, fruit & essential oils) these days and it works really well for him. In fact my little mate has just turned 15 last month and is doing really well on my preservative free diet. He no longer has seizures, his coat shines and he is very active for his age. When we are out walking most people are amazed when I tell them that he is 15! I am currently helping another client whom has small to med sized dog, he has had seizures most of his adult life and as far as I know had been on a diet of processed food. His owner has recently put him on my food about 3 months ago and they have reported that his coat feels amazing, he has a shine that wasn’t there before and not only have his seizures decreased but the duration of the seizures have too. This may improve with time, it may not. I assume it will depend on the dog’s current health (it could be a bad case of epilepsy) and how long he has been on processed food and the seizure medication. At least the change of diet has improved his health a little at this stage. Who knows in 12months he might be seizure free. That would be the ultimate outcome for the dog and owners! Perhaps it might be time to reconsider what your pets are eating and find something more natural? We need to take a stand and stop giving these companies our hard earned cash for such appalling pet food. Who knows you might find you may even spend less time and money at the vet! At this stage I have released my food locally in Cairns, Far North Queensland as I am only a small business operating from my home. In the future (if sales keep improving as they are) I will be looking at transporting my food interstate. Keep an eye on my Facebook page for updates. For the time being I am happy to help with any nutritional advice where I can, so if you would like any information or have any questions in regards to my natural, preservative free pet food (or any health issues that your furry friend has) please do not hesitate to send me an email, give me a call or message me on Facebook. March 11, 2016 | Filed under Canine Health.